The primary goal of the Ground-Motion Prediction focus group is to develop and implement physics-based simulation methodologies that can predict earthquake strong-motion waveforms over the frequency range 0-10 Hz. Source characterization plays a vital role in ground-motion prediction. At frequencies less than 1 Hz, the methodologies should deterministically predict the amplitude, phase and waveform of earthquake ground motions using fully three-dimensional representations of Earth structure, as well as dynamic or dynamically compatible kinematic representations of fault rupture. At higher frequencies (1-10 Hz), the methodologies should predict the main character of the amplitude, phase and waveform of the motions using a combination of deterministic and stochastic representations of fault rupture and wave propagation. Note: the GMP focus group also shares interests with the GMSV TAG (Earthquake Engineering Implementation Interface, EEII) and CME (Special Project) - consult these sections for additional GMP-related research priorities. Developing and/or refining physics-based simulation methodologies, with particular emphasis on high frequency (1-10 Hz and higher) approaches. This work could include implementation of simulation methodologies onto the Broadband Simulation Platform, or implementation of more efficient approaches in wave and rupture propagation schemes (in collaboration with CME), allowing accurate simulation of higher frequency ground motion in models with lower seismic wave speeds (e.g. in sedimentary basins). Determine spectral and spatial limits for simulating deterministic high-frequency wave propagation. Waveform modeling of past earthquakes to validate and/or refine the structure of the Community Velocity Models (CVMs) (in collaboration with USR). This includes exploration and validation of the effects of statistical models of structural and velocity heterogeneities on the ground motion, the significance of the lowest (S-wave) velocities as frequencies increase, the significance of including geotechnical layers (GTLs) in the CVMs, and development and validation of improved (possibly frequency-dependent) attenuation (intrinsic or scattering) models in physics-based simulations (in collaboration with USR). Quantify uncertainty in the CVM structure and its impact on simulated ground motions. Note that the Central California Seismic Project (CCSP, see below) targets this goal specifically for Central California. Develop and implement simulation methods for the modeling of bending faults and multi-segment ruptures. The highest priority need is for kinematic rupture generators for implementation on the Broadband Platform (BBP). Proposals are requested for 1) including the software modeling capability itself and 2) scientific research (e.g., analysis of dynamic rupture modeling on multi-segmented faults) to inform input parameters such as the timing of the ith segment rupture, moment distribution on segments and so on (see CME section on this RFP for related efforts). Investigate the importance of including 3D basin effects on ensemble averaged long-period ground motions on the BroadBand Platform, e.g., by comparing ensemble averages of long-period (<~1Hz) ground motions computed in 1D and 3D crustal models for events included in the GMSV. Develop and implement methods for computing and storing 3D Green's functions (GFs) for use in the Broadband Platform. Proposals for both source- and site-based GFs are solicited (see CME section on this RFP for related efforts). Develop and implement new models or implement existing models for frequency-dependent site effects into the SCEC BroadBand Platform (site effects module). Because site-specific profiles are rarely available for large scale simulations, the priority will be given to models that can work with generic site profiles or that use simplified site factors (e.g. empirical Vs30-based factors for example). Models that require a site profile as input will also be considered. The site effects models are to be applied so as to produce time series that include site effects. Incorporate off-fault plasticity into physics-based ground motion simulation methodologies, quantify uncertainties, and validate the effects using observations from large earthquakes. Development of more realistic implementations of dynamic or kinematic representations of fault rupture, including simulation of higher frequencies (up to 10+ Hz). Possible topics include simulation of dynamic rupture on nonplanar faults and studying the effects of fault roughness on the resulting synthetic ground motion, and development of kinematic representations based on statistical models constrained by observed and/or dynamic ruptures. This research could also include the examination of current source-inversion strategies and development of robust methods that allow imaging of kinematic and/or dynamic rupture parameters reliably and stably, along with a rigorous uncertainty assessment. Close collaboration with the Technical Activity Group (TAG) on Source Inversion Validation (SIV) is encouraged. Construct Equivalent Kinematic Source (EKS) models that approximate the effects of near-fault nonlinearities in a linear scheme and test the EKS model in CyberShake. Projects that involve dynamic earthquake rupture simulations should involve preliminary code testing using benchmarks developed by the Dynamic Rupture Code Verification Technical Activity Group (TAG). Verification (comparison against theoretical predictions) and validation (comparison against observations) of the simulation methodologies with the objective to develop robust and transparent simulation capabilities that incorporate consistent and accurate representations of the earthquake source and three-dimensional velocity structure. Compare and assess engineering metrics in ground motion validation. Comparison of synthetic ground motions from deterministic and stochastic approaches to data for overlapping bandwidths. Close collaboration with the Technical Activity Group (TAG) on Ground Motion Simulation Validation (GMSV) is encouraged. The primary goal of the Ground-Motion Prediction focus group is to develop and implement physics-based simulation methodologies that can predict earthquake strong-motion waveforms over the frequency range 0-10 Hz. Both media and source characterization play a vital role in ground-motion prediction and are important topics for GMP. Figure 1. P-wave velocity model in 3D view obtained from ambient seismic waveﬁelds. The color illustrates the fractional ﬂuctuation of P-wave velocities. The grey area shows the poorly resolved area according to the ray coverage. The black dots are the location of the stations projected at the depth of the horizontal slice. The red dot in the inset shows the location of the survey. From Nakata and Beroza, 2015. Figure 2. Fourier amplitude as a function of distance centered at 0.25 Hz for a simulation of the 2008 M5.4 Chino Hills, Ca, earthquake, with constant Q and frequency-dependent Q. Dots depict values for individual stations and lines depict a 5-point moving average. From Withers et al., 2015. Figure 3. Elasto-plastic reduction of peak ground velocity with respect to a visco-elastic conditions from dynamic simulation (fmax = 2 Hz) of a M 7.8 earthquake rupturing the southern segment of the San Andreas fault. Withers et al. incorporated frequency-dependent Q into AWP-ODC as a power-law, and demonstrated the effects using realistic parameters for the Chino Hills earthquake. Lozos et al. simulated rupture on the northern San Jacinto fault using complex fault geometry with step overs, and a 3D velocity model. The results were combined with high-frequency scattering functions to generate broadband synthetics. The broadband synthetics were found to be in good agreement with the presence of precariously balanced rocks and leading GMPEs. Graves and Pitarka characterized kinematic ruptures for ground motion simulation of shallow crustal earthquakes, including shallow and deep 'weak' zones and mapping the effects of perturbations to the fault surface. Baker derived a predictive model for fling period and amplitude and compared to existing models. They found that ground motion simulations provided a rich and reliable data source for fling step, indicating an additional engineering use case for simulations. The work also validated the ability of simulations to predict fling in conditions not well captured by empirical data sources. Bradley et al. developed a new 3D seismic velocity model of Canterbury, New Zealand. The model explicitly represents the Canterbury sedimentary basin, and other significant geologic horizons, which are expected to have important implications on observed ground motions. Archuleta illustrated the undesired effects of rapid amplitude decay with distance of high-frequency (HF) synthetic ground based on 1D crustal velocity structures. He showed a simple solution to this problem by separating the wave propagation problem into a simplified single layer on top of a half-space for the HF portion of ground motion and a more realistic 1D multilayer model for the low-frequency portion of ground motion. Holden and Gerstenberger conducted broadband ground motion simulations using a suite of moderately sized aftershocks (M5.3+) from the Canterbury sequence. They used these simulations to investigate the sensitivity of near field ground motions to key engineering parameters including stress drop and rupture details such as velocity, directivity and slip distribution. Results show that adoption of parameters derived from spectral inversions of the strong motion dataset and method provides an improved and robust fit to the observed data, emphasizing the need for region-specific considerations and the implications this has for GMPEs. Beroza and co-workers worked on using ambient seismic field data to explore amplification in urban Tokyo. They used a combination of 375 Hi-Net deep borehole seismometers across central Honshu as virtual sources and 296 seismic stations of the MeSO-Net work shallow-borehole seismometers within the basin as receivers to map the basin impulse response. They found a linear relationship between vertical ground motion and basin depth at periods of 2 – 10 seconds that could be used to represent 3D basin effects in ground motion prediction equations. They also found that the strength of basin amplification depends strongly on the direction of illumination by seismic waves. Shaw and Jordan presented a statistical description of fine-scale velocity structure in the sedimentary basins of southern California that is intended to support high frequency ground motion simulations for earthquake hazards assessment. They defined the variability in both Vp and Vs, and established vertical and horizontal correlation lengths for fine-scale velocity structures using wells across the basin as well as in tightly clustered oil fields. Roten et al. continued to examine the effects of elasto-plastic rheology on ground motions. Previous nonlinear simulations of the ShakeOut scenario based on a kinematic source have suggested that plastic yielding in the fault damage zone may reduce ground motion levels in the Los Angeles basin (LAB) by 30 - 70 % with respect to linear solutions. 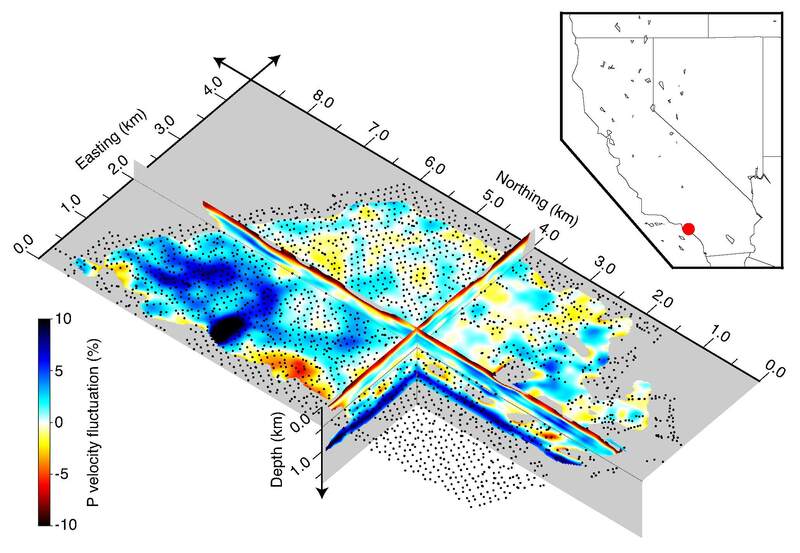 New simulations of spontaneous rupture were carried out on a planar, vertical fault roughly following the surface trace of the southern San Andreas fault (SAF) along ~250 km between Indio and Lake Hughes. Because the source in these simulations is fully dynamic, these simulations are comparable to benchmarks TPV26 and TPV27 of the SCEC/USGS dynamic rupture code verification exercise, which have been used to verify the AWP-ODC FD code with plasticity against several other FD and FE methods. These new simulations confirm that long-period (< 1 Hz) peak ground velocities in the LAB would be reduced by up to 50% if sedimentary and crustal rocks are assumed to be nearly cohesionless. However, the dynamic simulations also show that PGVs in the LAB may still exceed 2 m/s if the strength of crustal rocks and sediments is very high (> 10 MPa). This result indicates that ground motions are more sensitive to the strength of crustal rocks than indicated by previous dynamic simulations, and highlight the need to better constrain the friction angles and cohesions used in such nonlinear simulations of dynamic rupture and wave propagation. Nakata and Beroza developed random-field model representations of a 3D P-wave velocity model under Long Beach, CA, estimated from dense-array recordings of the ambient seismic wavefield. They find that a von Karman model fits the imaged velocity model best, with horizontal and vertical correlation lengths of 0.51 km and 0.1 km, respectively, and a Hurst number of 0.040. They validate their results by showing that their model accurately predicts the observed decay of scattered waves in the coda of a nearby earthquake. Using noise correlation measurements from the Long Beach Array, processed to maintain relative amplitude information, Tsai et al. produced maps of surface-wave ground motion amplification over a range of frequencies from 0.67 Hz to 2.0 Hz. These maps show that ground motion site amplification can vary by a factor of 4 over distances as short as a few hundred meters, throughout the city of Long Beach, CA. The spatial amplification patterns are generally consistent with those that would be predicted from shallow velocity anomalies, but provide direct measures of amplification and are therefore more robust than amplification computed indirectly from velocity structure. Dunham et al. performed 2D dynamic rupture simulations on rough faults in heterogeneous media to determine the relative importance of source complexity and scattering in destroying coherence of the high-frequency seismic wave field. Their simulations demonstrate that random elastic heterogeneity of the off-fault material, at levels representative of the crust, have only minor influence on the rupture process. Fluctuations in slip and rupture velocity are instead controlled by complex fault geometry. This conclusion is expected to carry over to 3D. An additional result of this study was that the effects of scattering became appreciable only beyond a few kilometers from the fault. At closer distances, incoherent high-frequency ground motion was dominated by source complexity. This result will likely change in 3D, and Dunham's group has developed a 3D version of their rupture dynamics code to address this problem. SCEC has completed phase 1 of its Broadband Platform (BBP) ground-motion simulation exercise, evaluating the potential applications for engineering of the resulting 0.01–10 s pseudospectral accelerations (PSAs) generated by five different methods. The exercise included part A, in which the methods were evaluated based on the bias of simulation results to observations for 12 well-recorded historical earthquakes: 7 in the western United States, 2 in Japan, and 3 in the eastern United States/Canada. In addition, part B evaluated simulation results for Mw 5.5, 6.2, and 6.6 scenarios at 20 and 50 km from the fault. The methods were assessed based on the bias of the median PSA for the 12 events in part A and on a specified acceptance criterion compared with Next Generation Attenuation-West (NGA-West) ground-motion prediction equations (GMPEs) in part B. The results were evaluated by the bias of mean PSA from simulations using 1D velocity models with average shear-wave velocity in the upper 30 m of 863 m/s with respect to recorded data corrected for site effects. Nine articles describing the scientific and technical accomplishments were published in a focus section of the January/February 2015 issue of Seismological Research Letters. As part of SCEC’s High-F research initiatives, verification and validation of deterministic ground motion prediction for the 2014 M5.1 La Habra, CA, earthquake is underway. Three codes currently participate in the comparisons, namely AWP-ODC and AWP-RWG (4th-order finite difference, FD) and Hercules (2nd-order finite elements, FE). The exercise uses a point source with mechanism derived from strong-motion data and a slip-time history obtained from a dynamic rough-fault model with frequency content up to 5 Hz. 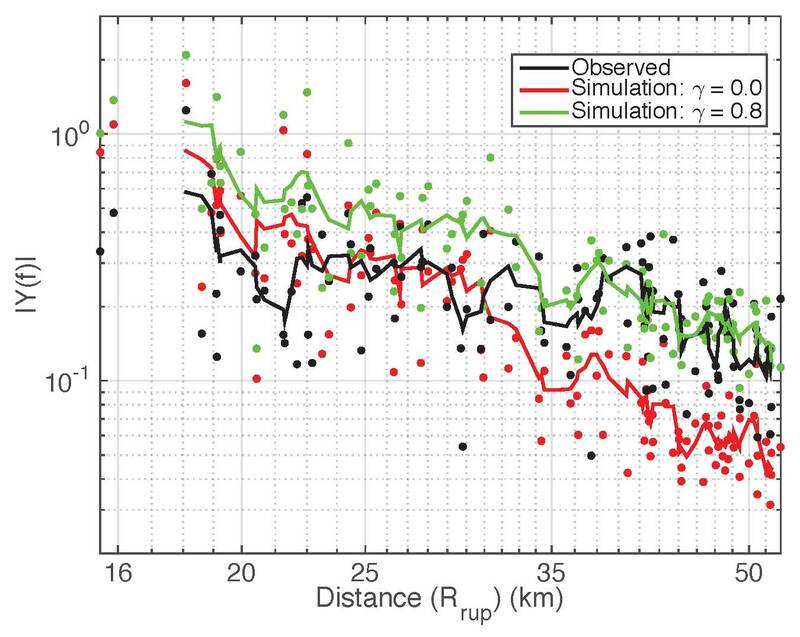 The areal extent of the simulation region is 180 km x 135 km, with a target depth of 62 km. The model covers the entire greater Los Angeles basin and other structural features in its vicinity. The verification has progressed in incremental steps from a simple halfspace model via a smooth 1D crustal model, to ongoing efforts involving 3D crustal variation and a minimum S-wave velocity of 500 m/s. Comparisons between codes have been made with lossless and frequency-independent anelastic attenuation, with tests exploring the significance of frequency-dependent Q. Results from the verification exercise at the various complexity levels have allowed to identify the numerical parameters necessary for the codes to yield synthetics with a satisfactory level of agreement. Current efforts include verification and validation in a 3D volume of the CVM-S4.26, where strong motion data is available at 350+ stations within the model region. The simulations have primarily been carried using parallel processing on NCSA Blue Waters. of basin amplification depends strongly on the direction of illumination by seismic waves. Graves, R.W., and A.Pitarka (2015). Refinements to the Graves and Pitarka (2010) Broadband Ground‐Motion Simulation Method, Seismological Research Letters, January/February 2015, v. 86, p. 75-80, First published on December 17, 2014, doi:10.1785/0220140101.